Monday, August 21st was the Solar Eclipse across the USA. I setup for the Solar Eclipse QSO Party at Kinsaul Park in Lynn Haven, Florida. I had a short turnaround time since I had just got back from the Huntsville Hamfest Sunday Night. I was pleased to get all the gear packed up and then setup at the field. 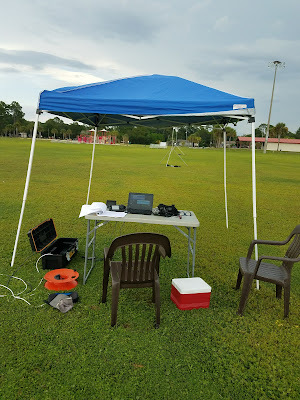 It included the 100-foot vertical loop I built for Field Day, the Icom 7100 transceiver and my laptop computer. 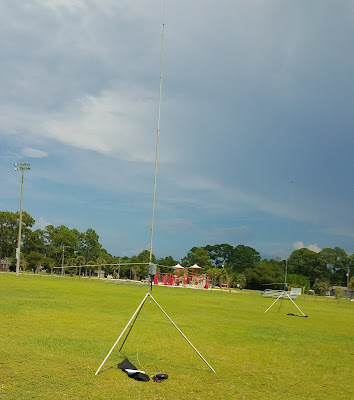 I also deployed two Bravo 7K verticals each with a WSPRlite beacon. 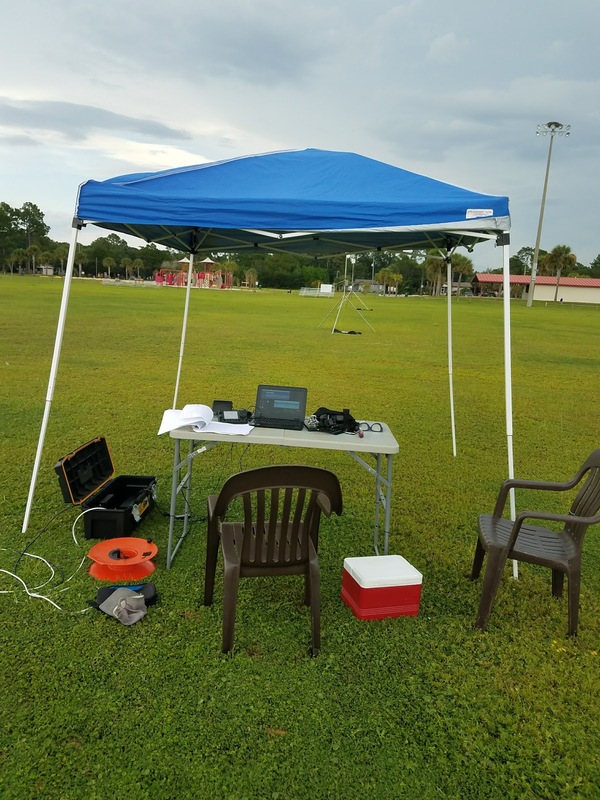 The goal of the Solar Eclipse QSO Party was to maximize activity on the HF bands This would provide lots of data for the Reverse Beacon Network, PSKReporter, and Weak Signal Propagation Reporter databases for the scientist to study. My WSPR Beacons contributed. 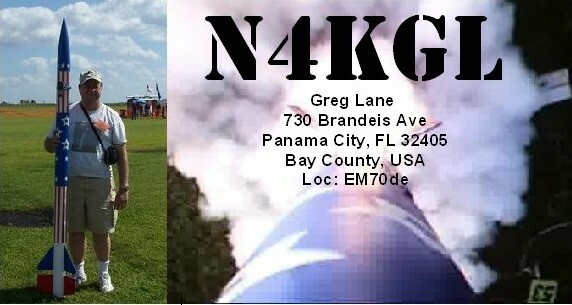 I also called CQ on CW many times which was captured by the Reverse Beacon Network. 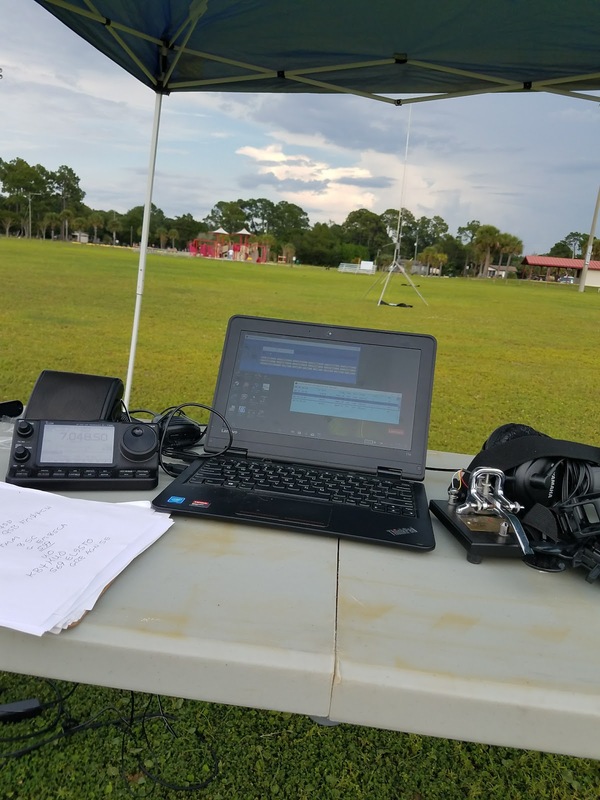 I did get answers to my CQs including fifteen contacts of 20 meters and three on 20 meters. I will turn the log I made using the N1MM+ logging software. I could not discern any dramatic effects of the eclipse on my reception. 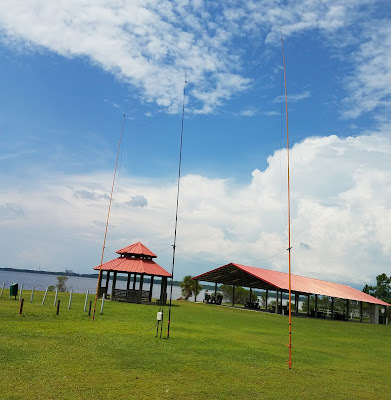 However, at the maximum, I had a Canadian contact on 40 meters. It is unusual for me to work that distance on 40 meters in the daytime. As the sky got darker, many small birds and dragonflies joined us. The birds used the radials on the Bravo 7K verticals to roost. I enjoyed getting a visit from Bob KK4DIV in the morning. My wife Linda also came by and we enjoyed looking at the eclipse together. The maximum was about 85% at 1:38 PM. 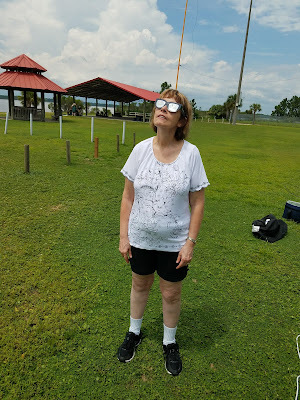 The were lots of clouds during the day but there were enough breaks to see the solar eclipse. My gear under the canopy. I had a second reason for the two vertical with WSPR beacons. I wanted to see if the spots would be similar. My previous salt water effect tests assume the two setups are equivalent. The simultaneous spots compared very well. However, one beacon had almost double the spots of the other. It could be the beacon or the antenna. It also could be that there was another station on the same frequency for one beacon. Oh well, this will mean more tests to sort this out. I think the process of setting up the gear outside for various events is good practice for what ever situation may come up. This setup was pretty much my Field day setup. You always want to get to the field with all the gear you need right down to those coax barrel adapters. This time I was successful.